Triumph revealed the Speed Twin, its latest retro-modern roadster that draws inspiration from the 1938 Speed Twin recently. Like its namesake, the Speed Twin promises to blend agility with a retro modern design by borrowing parts from the sportier Thruxton cafe racer. We expect this bike to debut in India next year and when it does, it will face heat from Kawasaki’s neo-retro Z900 RS and BMW’s gorgeous R NineT roadster. We compare the three to see which one comes out on top. On paper that is. The new Triumph Speed Twin looks like a larger and sportier Street Twin. It comes with the right ingredients of a retro modern roadster with design elements like a classic looking fuel tank, flat seat and twin upswept exhaust, chopped mudguards with a brushed aluminium finish, chrome accents on the faux carburettor covers and 7-spoke alloy wheels. When launched, the bike will be sold in three colours: Jet Black, Silver Ice/Storm Grey and Korosi Red/Storm Grey. Features include LED headlamp, tail lamp and turn indicators, ride-by-wire, three riding modes, switchable traction control and ABS. The twin pod instrument console includes a speedometer, tachometer and digital display for the odometer, trip meter and fuel level. It also gets an engine immobiliser, a USB charging port and an optional tyre pressure monitoring system. It gets LED headlamp, turn indicators and tail lamp, while the twin-pod instrument console gets a digital LCD screen in the center. The console displays an analogue speedometer and tachometer while the digital display shows the odometer, fuel level, engine temperature and gear position indicator. It misses out on traction control but gets three rider modes and ABS. The BMW R nineT is one gorgeous modern interpretation of the 70’s R90 naked motorcycle. It gets a large, sculpted fuel tank, a slim seat and tail section, and an air-cooled boxer twin motor nestled in between. It is also the only one of the three to feature spoked wheels. Like the Z900 RS, it gets a halogen equipped headlamp with an LED tail lamp. It also gets a similar twin-pod instrument console with twin digital insets. It has an analogue speedometer and tachometer with digital readouts for the odometer, tripmeter, average speed and fuel efficiency, distance-to-empty and service indicator. It misses out on rider modes and traction control, but gets ABS. 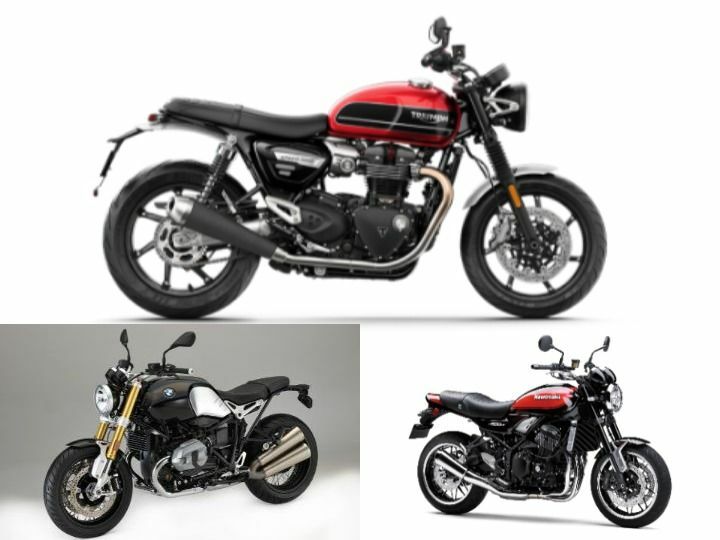 Of the three, the BMW R nineT still remains the best looking bike with the Triumph Speed Twin coming a close second. However, the Speed Twin does pack quite a few features like LED lighting and rider aids and hence, would be our pick here. All three motors here offer a different riding experience. The Speed Twin has the largest engine size and its parallel twin motor comes with a 270-degree crank. This allows for better low-end grunt and a distinctive V-twin like soundtrack. The 1200cc motor is from the Bonneville family and comes in the same ‘High Power’ state of tune as the Thruxton R.
In a similar fashion, the Kawasaki Z900 borrows its inline-four motor from the Z900 naked bike. However, it comes in a more relaxed state of tune and makes less power than the Z900’s 125PS output. It is the first time that Kawasaki engineers have worked on the soundtrack of their models and as a result, the Z900 RS promises a sonorous inline-four exhaust note. The BMW R nineT makes the most amount of torque here and promises a unique, more old-school riding experience thanks to its horizontally opposed twin cylinder layout and shaft drive. Compared to the other two the BMW has a slightly heavier clutch feel as well. There are no clear winners here. It depends on what you are looking for from your bike as all three offer different riding experiences. The Triumph Speed Twin gets its chassis from the sportier Thruxton but misses out on the higher spec Thruxton R’s Ohlins setup and instead gets KYB suspension. It does get premium Pirelli Diablo Corsa 3 tyres for more fun around corners. Given the chassis setup and premium rubber, expect it be agile. With a frame borrowed from the Z900, the Z900 RS is not far behind either. It comes shod with Dunlop GPR-300 retro-styled tyres. The BMW R nineT gets adjustable front USD forks, a rear monoshock and Metzeler rubber. Here, the Speed Twin comes on top on account of its agile frame and premium tyre setup. While the Speed Twin is set to go on sale in various international markets in January 2019, we expect the bike to be launched in India by the first quarter of next year. It is expected to come via the CKD route and be priced around Rs 10 lakh. The Kawasaki Z900 RS is priced substantially higher at Rs 15.3 lakh (ex-showroom), which is quite surprising since most of Kawasaki India’s products are very competitively priced. The reason for the premium price is Kawasaki’s decision to exclusively manufacture the Z900 RS in Japan and export it worldwide. Hence, the Z900 RS’s CBU tag attracts a high import duty. The BMW R nineT is the most expensive one here, retailing at 17.3 lakh (ex-showroom). It offers the most authentic ride experience too. However, the Speed Twin’s expected pricing should make it good value as a neo-retro roadster that handles and performs well. We can’t wait to get our hands on one. In what way is it the best? In what way is it the best?